I was a feverish lemonade stand entrepreneur in my childhood. I found great satisfaction in making my own money… and I had very kind (or very thirsty) neighbors. I spent a lot of time at the end of my driveway with my baby sister on my lap looking cute and rolling in the dough. Trevor and I suffer from Real Estate-itis… and we spend a long time driving around looking at homes for sale (often with no real intention of buying one!) It was on one of these real estate tours that we ended up driving an aptly named “Mountain Road” that was not paved and serviced approximately 15 houses over a 15 mile stretch of road. Remote is not a strong enough word. So we certainly did a double take when we turned a corner and saw a cheerful lemonade stand at the end of one of the steep gravel driveways. What were they thinking… a lemonade stand out here?! Actually – it turned out they were on to something. We, of course, stopped for a lemonade. How could you not? These two sweet little girls with their sunny yellow sign seemed so out of place in the depths of the boonies. We asked “How’s biz?” and they were modest with their response… but on our way out of the backcountry, they actually had a line up (albeit a small one) for lemonade. Piano teaching lesson? Choose where you advertise. Don’t always place your piano lesson advertising in “to be expected” areas like bulletin boards, newspapers, or telephone poles. By placing your advertising in unexpected places you will get noticed! Most lemonade stand entrepreneurs have no inhibitions about advertising their product. They wave at cars, hold large signs, and shout at each passerby like a sideshow barker. And it works; people notice them.. they sell lemonade. Piano teaching lesson? 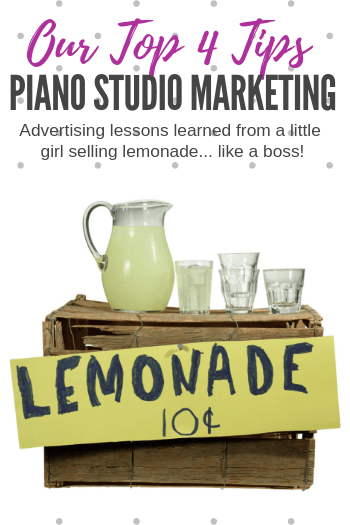 Don’t be shy about advertising your piano teaching studio. I’m not saying you should bark at those passing by, but you certainly should find every opportunity to market yourself and be bold and confident when pursuing new clientele. A marketing study done by Stanford Business School found that lemonade stands that did not mention price made more money than those that were blatant about the cost to the customer. And in fact, the lemonade stand that didn’t mention money (but instead mentioned customer enjoyment) actually received more dollars per glass than the ones who had the mention of money in the forefront. Piano Teaching Lesson: Market your piano studio based on what you will offer to your students, not how much (or how little) it will cost them. Lemonade stands do one thing very well… sell lemonade. You’ll notice they don’t also offer espresso, paninis, and enchiladas. They sell lemonade because, for a young child, it’s easy to make and easy to serve. They choose one product and sell it well. …and with that unintentional pun, I’m off to finish my cinnamon lemonade. Wondering What to Do With Apathetic Piano Students? Are You Due For Some Duets? Finding New Piano Students: Before They Meet You What Do They See? Reinforcing Piano Theory Concepts With Micro Cars? Yes!